This article is about the process of enchanting Dragons. For other uses, see Enchantment (disambiguation). Introduced in Update 2.3, Enchantment enables Trainers to increase the Health and Attack of Dragons, and also offers the opportunity to breed for exclusive Dragons. Trainers can access the Enchantment menu through the button on the bottom left of the screen. Trainers can also select the Enchantment Altar to access the section for enchanting Dragons by selecting the button or to access directly the section for fusing materials by selecting the button. Enchantment is only unlocked once the Trainer levels a minimum of three Dragons to Level 16. Once the conditions are met, the tutorial will pop up on its own, allowing the Trainer to enchant their three strongest Dragons by one star for free. A Dragon must be Level 16 before it can be enchanted up to four Enchantment Stars. Level 50 is required for the fifth Enchantment Level, Level 65 for the sixth, Level 80 for the seventh and Level 90 for the eighth and final Enchantment Level. The level limitation does not apply to opposing NPC Dragons. Enchanting Dragons requires Enchantment Materials which can only be obtained from Enchantment Chests, Ascending or from deals in the Whale-Mart. This allows the enchanted Dragon to fight in the Enchantment League while also increasing the Base Attack and Base Health stats of the Dragon, and also, where applicable, to engage in Enchanted Breeding. 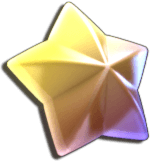 There are eight Enchantment Levels, represented by Enchantment Stars. The first four levels are each represented by a golden Enchantment Star while the last four levels are each represented by a purple Enchantment Star. Each Enchantment Star, regardless of color, increases the stats of a Dragon by the equivalent of 2 levels; thus with 1 star, a Level 56 Dragon has the same stats as a Level 58 Dragon of the same species. Once a Dragon is enchanted, the process is irreversible and the effects will carry over wherever the Dragon is used, even when hired by friends. In the Enchantment screen, the strongest Dragons are shown at the top, but the Trainer can filter them by pressing either the button or the button. The former is used to filter the Dragons by their Element or by (the default view), while the latter allows the Trainer to search a Dragon by their name. All the Trainer's Dragons have their mugshots displayed inside a horizontal, rectangular snapshot in a sidebar on the left-hand side of the menu while the highlighted Dragon has its mugshot displayed inside a vertical, rectangular snapshot in the middle of the screen. 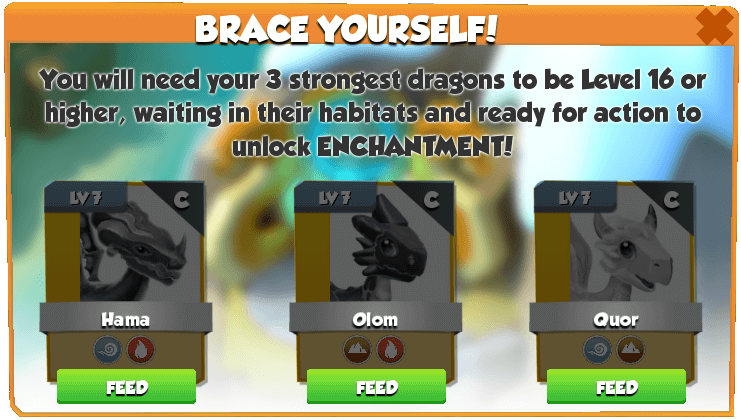 Each Dragon will have its given name, rarity, Elements, level, skill level, and number of Enchantment Stars on both snapshots while the second snapshot will also have the button for accessing the Dragon's own Codex Entry. Additionally, the sidebar snapshots will indicate if a Dragon is eligible for enchanting through the icon. Under the second snapshot, the required grade, as well as amount of Enchantment Materials to enchant the Dragon is shown, and under those the button can be pressed to enchant the Dragon, provided the Trainer has enough resources to do so. Next to the Dragon's image, the Trainer can see a preview of the amount of Health and Attack the Dragon will have for its next Enchantment Level. Additionally, if the Dragon's Enchantment Level is at maximum, the "Max Enchantment Level Reached" text will be shown next to the Dragon's image. Dragons that can not currently be enchanted will have their snapshot grayed out along with the reason that prevents them from being enchanted, such as breeding, exploring ruins, not having reached the required level, so on and so forth. The Enchantment Materials under the highlighted Dragon's snapshot are displayed inside a square with white background whose border color depends on the availability of the material. Materials which are not in a sufficient quantity for the next Enchantment Level have a red border while those who are have a green border. Each square has the button in its corner which can be used to access the screen for purchasing Enchantment Chests. Enchanting a particular Dragon can also be done from its Habitat through the button that appears in the right of the screen when the Dragon reaches Level 16. Pressing it will take the Trainer to the Enchantment screen and the aforementioned Dragon will be automatically selected. The amount of Enchantment Materials required to reach each Enchantment Level depends on the rarity of the Dragon and the number of its Elements. In this screen, the Trainer can select which material to fuse by selecting the icon of any Element. Here, the Trainer will be shown how many materials of each grade they have and how many material of the previous grade is needed to fuse to the next grade. Pressing the button will fuse the material, provided the Trainer has enough of that grade and also sufficient Enchanted Trinkets to pay the cost. The option under the lower-grade material can be selected and it will take the Trainer to the screen for purchasing chests that contain Enchantment Materials, as well as Trinkets. Materials can only be fused to a higher-grade Enchantment Material of the same Element. Enchantment Materials have different drop rates according to their Elements. Fusing a material is an irreversible process and there is no method to obtain lower-quality materials from higher-quality ones. Below the 5th tier of the Enchantment League, the Divine Materials come only in average quality, so all other qualities have to be fused from average material. Enchantment Material can be requested from Clan members by selecting the button. The Trainer can request either 1 fair or 1 average material at once, with a maximum of 8 fair and 1 average materials in under 24 hours. Once a request is sent, the Trainer must either wait until a fellow Clanmate has donated the requested material or 24 hours before being able to send a new request. Donators will receive 1 Enchanted Trinket for 1 Fair Material and 6 Enchanted Trinkets for 1 Average Materials. A donator can donate up to a maximum of 24 times per day. Legendary and Divine materials can not be requested or donated. Enchantment introduced a distinct way of breeding certain Dragons along with new upgrades to the Breeding Den. The Enchantment League is a competition where Trainers face each other to win various Enchantment Materials, as well as Enchanted Trinkets. Update 4.5 introduced the option of requesting or donating Enchantment Materials from Clan members. Update 4.0 introduced 4 more Enchantment Levels represented by the icon and replaced the icon with the icon. Starting with this update, there is a chance that Divine Enchantment Material will come in a higher quality than average from chests in the 5th, 6th and 7th tiers of the Enchantment League. Ascending was introduced, which gives Trainers a new method to obtain Enchantment Materials. The background color of Dragons presented in the sidebar of the Enchantment screen has been modified in order to match the color of their rarity while Enchantment Materials received a white background bordered by either green or red edges. The picture inside the Enchant Button has been replaced. 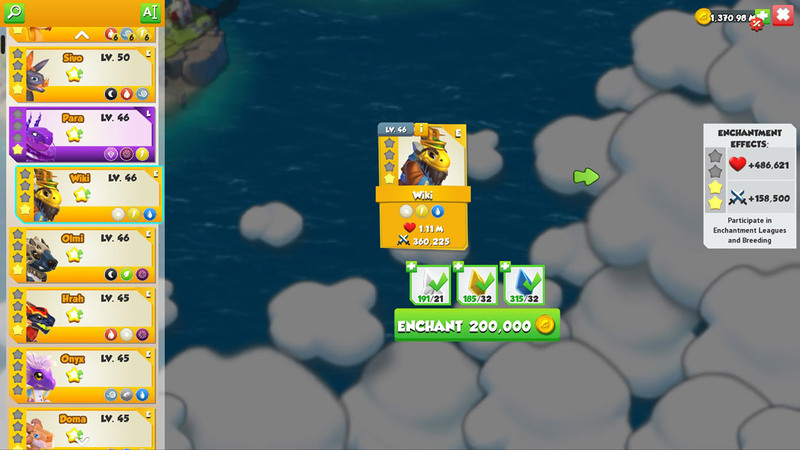 Update 3.7 introduced the Whale-Mart along with the possibility of obtaining Enchantment Materials through this feature. Update 3.1 introduced Enchantment Materials for the Divine Element as part of the introduction of that Element. Update 2.9 replaced the button with the button. This page was last edited on 18 April 2019, at 07:08.